Whilst we were up in Skipton the other day I got to try an interesting salad dish and an equally interesting serving of it. Well, actually it was three different ones. At the Forage Cafe and Deli they offer a selection of home made salads which, if one picks from their Forager’s Board, you can select three (or more) different salads to try together. Wild Rice with Coconut, Carrot, Spring Onion and Almond – The coconut flavours were subtle and light. They were all super-delicious, freshly made and bursting with flavours. If only we could be assured of having interesting and flavoursome salads on more restaurants. In far too many eateries Salad means a small handful of wet lettuce leaves with some carrots julienne plonked on top. Uninteresting and unexciting. 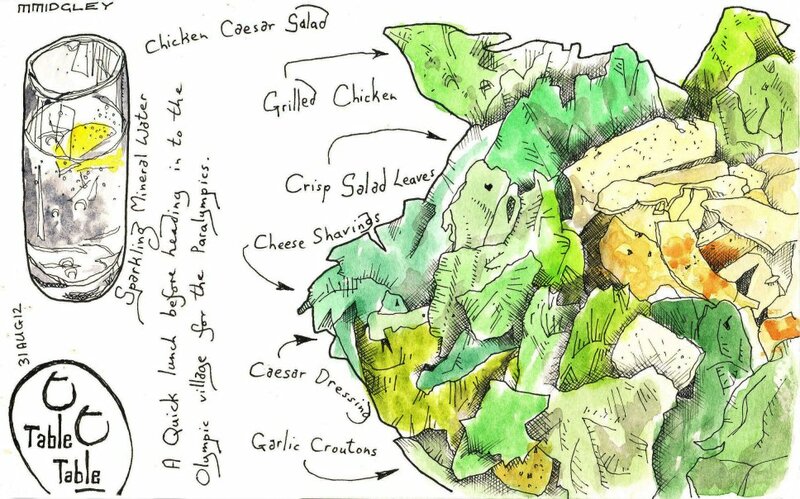 More people would try and enjoy salad if they were as stimulating as the ones at Forage. I booked my table under the name Pfeiffer. Whenever I book a table at a restaurant I always book under a different name than my own. Brook’s has crayons on each table and invites guests to draw and doodle on the paper tablecloths; allowing for grand romantic gestures and … er … doodling. The food is divine; presentation and flavours are excellent. 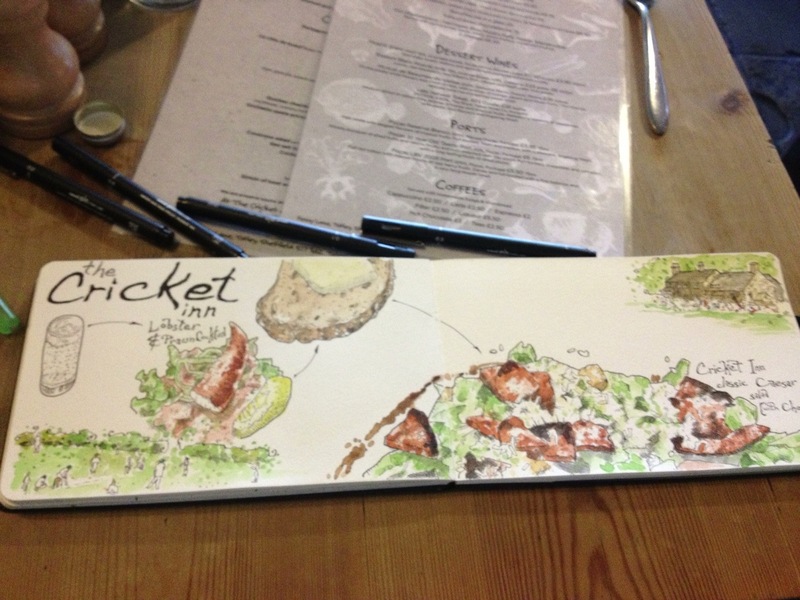 But, being a fine dining experience usually – I felt unusually self conscious as I drew and ate. Other diners were here on special occasions with family, friends and loved ones, whilst I sat on my own. At least the owner came over and admired my work – and brought me a glass of wine over whilst we chatted. I find salad leaves and tomato particularly tricky illustrate; I think it’s because they have a translucent quality that doesn’t lend itself to having an ink outline – I will continue to persevere. Perhaps a layering of colour washes would suit better. Additionally tomatoes have a peculiar red/orange colouration, as well as solid and translucent colouring. Tricky blighters! Blakeley’s is one of those popular, local cafes which never seem empty. As we queued there’s a tension as to whether we will actually bag a table, or not. We can only dream of finding a space at one of the two window tables! Next on the list for favourite, and therefore highly sought after, spaces are the two tables with settees, rather than regular chairs. The table we managed to get was right beside the door in and out of the kitchen serving area. Now I do actually like sitting in this spot in cafes – sitting amongst the hurly burly of the waiters and waitresses as they sweep past carrying trays of freshly prepared dishes and returning with the detritus of completed customers. I choose a light, warm salad today – which seemed to fit with the early summer sunshine well. Had a lovely afternoon lazing about in the summer sun watching a Mods versus Rockers cricket match over in Sheffield. Of course I foolishly expected them all to be dressed in their 50s costumes. Which they weren’t! But we did have music from the period being played. I couldn’t resist drawing my lunch at the pub, which has quite a good reputation for it’s food. 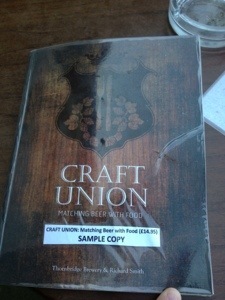 Some of the dishes featured on the menu were also featured in a book published by the brewery. I was very tempted to buy this as the recipes all sounded delicious and all had the beers and ales either in the recipe of as suggested accompaniments to the meal. Y’know, this is awfully confusing … I’m still catching up with posts that should have been, er, posted way back last October when we went to Cyprus. Anyhoo … here’s my lunch for the Thursday afternoon; a delicious Greek Salad. Some followers (and you know who you are) accuse me of solely drawing brown food. Well here is a definitely-green meal. I sat on the verandah of the hotel to draw this, but hadn’t banked on the sun moving about. It wasn’t ducking and diving, but I spent so long over my drawing, that the sun had moved to shine directly onto my salad. Oh dear! By the time I got to eat it the poor salad leaves were quite, quite wilted and had become a warm salad. All this meal drawing … I’m going to have to take care choosing what I want to eat/draw. Otherwise I’ll end up with a sketchbook full of the same kinds of meals. Maybe salad was a bad choice, though! Byt, then, if I’m going to draw/eat a salad, what could be classier than a Caesar. What a delicious combination of flavours and textures. All those leaves drove me a bit crazy; tricky to pull off a good salad leaf, I think.